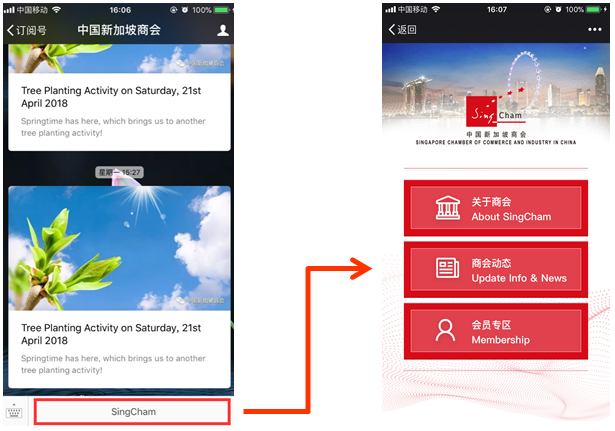 We are delighted to inform you that SingCham official account has been upgraded in order to make our Wechat account more user friendly for you. Please click on [SingCham] buttom from WeChat official account to find out more details. FREE advertisement for 6 months !!! SingCham members can advertise their special offers/promotion/discount under " Co-operative Merchants". *subject to SINGCHAM committee approval. *from 1st May 2018 to 31st Nov 2018. 3. As a pre-requisite, merchant shall extend a benefit or discount for its services/products to SingCham members. 4. Each merchant shall be limited to one free advertisement or publication. 5. 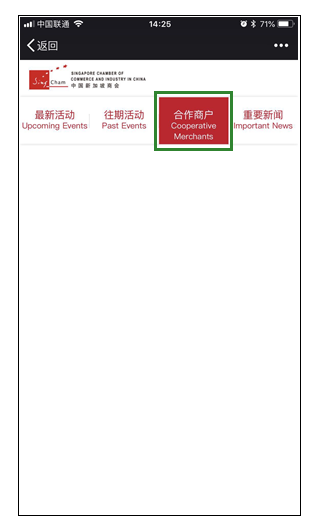 SingCham bears no responsibility or liability in respect of any statement or publication (including but not limited to any marketing materials) provided by the merchant and which is uploaded on the SingCham WeChat portal. 6. SingCham reserves the right to remove, amend and approve any material and publication which is uploaded on the SingCham WeChat portal. Please send your materials to SingCham Secretariat, Ms Elsa Liu at singcham@singcham.com.cn.